The CubeSat standard created in 1999 gave the impulse for a new era for educational space programs. A CubeSat is an assembly of elementary and standardized units measuring 10x10x10 cm3 for 1 kg called 1U. The standardized platform allows lower budgets and shorter development periods for academic and industrial missions. Moreover, space engineering with hands-on experience becomes reachable by students thanks to this educative tool. This new class of spacecrafts came with the drawback of high mass/volume constraints for avionics and payloads. 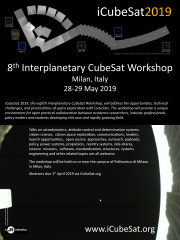 Through this publication, we are demonstrating the feasibility and the interest of a compact deployable telescope fitting within a 12U CubeSat platform (34x22x22 cm3). This multipurpose payload is currently sized for a lunar CubeSat orbiter, named SIRONA (project lead by CentraleSupélec) and will contribute to the determination of the age of some of the Moon’s oldest surfaces. CubeSats often include optical systems for fulfilling their scientific goals, such as imaging of the Earth’s surface or astrophysical bodies. Under these conditions, better optical resolution signifies greater scientific return. However, this parameter is highly mass/volume demanding. Indeed, telescopes need optics to be places at specific distances from each other. These optics and the alignment structure have important weight and if the instrument is not deployable, the imposed distance between the elements means valuable space not physically used inside a CubeSat platform where each cm3 is valuable. In order to solve the problem, we propose to deploy the full telescope, saving considerable volume inside the CubeSat for the avionics and other instruments. Our innovative instrument aims to unfold from a volume of 10x10x3 cm3 to 10x10x25 cm3. This payload will achieve high resolutions of 1.5 meters/pixel at 200 kilometers of altitude, using a f/10 Ritchey-Chrétien telescope of 900 mm focal length, weighting less than 500 grams. The payload will first fly on the SIRONA mission, to image the Moon’s surface in the near-UV spectrum in order to date the surfaces named lunar maria basins. To accomplish this ambition, the crater counting technique will be applied. The technique determines precisely the age of the surfaces, by using a surface initially untouched by craters, and assuming a constant flux of asteroid impacts. To conclude, the deployable telescope, by its innovative design that combines compactness, lightweight and high performance, expands the capabilities of CubeSats for planetary remote-sensing.